Naomi, Leona and Vince Lastreto pose for a family photo. As a California native and a Queens University of Charlotte graduate with a degree in political science, Vince Lastreto did not see NC State in his future. Lastreto moved to Charlotte in 2009 to be closer to his mom who had moved there two years earlier. Once there, he began attending Queens University where he fell in love with two things: North Carolina and his future wife Naomi. 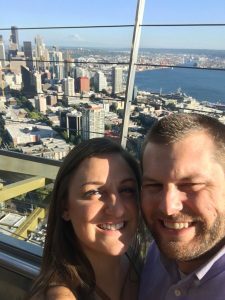 Naomi and Vince Lastreto at the top of the Space Needle. “Like many political science majors, I thought law school was my next step after graduation. My dad is a judge so I felt like it was in my blood, but I quickly realized that law school wasn’t where I saw myself,” said Lastreto. 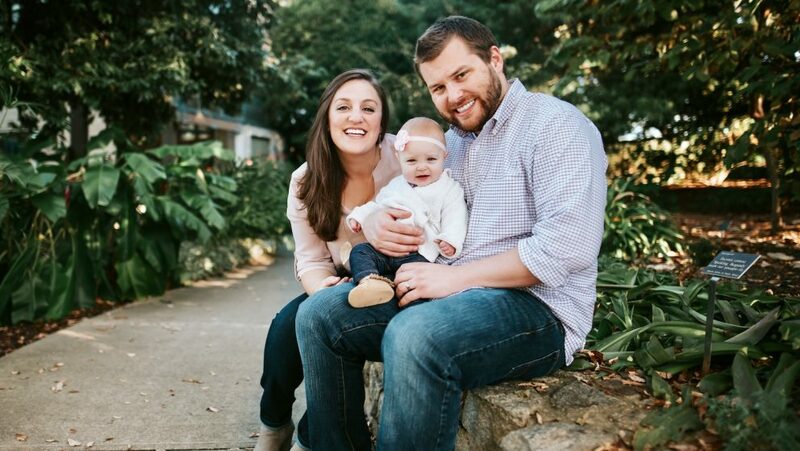 In 2013, his wife was offered her first nursing job at Duke University Medical Center in the Raleigh-Durham area. Lastreto eventually decided to pursue his master’s degree in Learning Design and Technology at NC State’s College of Education. He worked at the bookstore on campus where he met DELTA testing coordinator, Brad Collins. Collins informed him of a job opening within the Online and Distance Education Administrative Services office at DELTA. By 2015, Lastreto was hired as a DELTA testing associate. How would you describe your position at DELTA? “My official title is a testing associate, but I feel a lot more like a jack-of-all-trades,” said Lastreto. His responsibilities include a variety of faculty and student support services for both remote sites and Test Centers located on campuses. “My main role has always been proctoring exams for distance education courses, but the proliferation of on-campus students and faculty using our services has changed that. People are more aware of what we offer. We hope to continue growing and providing our services to all types of students,” he added. Expansion options are definitely a possibility in the future. 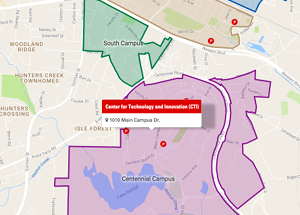 “Between the two testing centers last week, we saw 1,000 students in a single day. We’re just bursting at the seams right now. It’s an exciting time,” he added. What have been some of your favorite experiences at DELTA? “I love having the opportunity to attend a professional conference every year. We’ve gone on a lot of awesome trips. It’s cool to see different places and learn from all sorts of people,” said Lastreto. 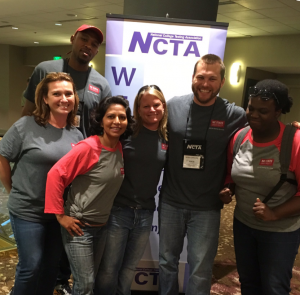 Vince and DELTA co-workers at the NCTA Conference in Seattle in 2016. He also liked shooting an ESPN SportsCenter-inspired video featuring the Do’s and Don’ts for DELTA Testing Services. “Brad and I got to do that one together, and we just had a ton of fun with it. He’s become a really good friend of mine over the years,” he added. But Lastreto has another interesting project on the horizon with a member of DELTA’s instructional design team. “I’m really excited about the project I’m working on with Rebecca Sanchez. We’re putting together a faculty orientation module in order to help instructors who are new to our services. Our goal is a more interactive learning experience for the users,” explained Lastreto. What makes your job special? What do you enjoy most? “I’ve realized I genuinely like working on a college campus, particularly in such an innovative and forward-thinking environment like we have here at State,” said Lastreto. He said he just enjoys being in a position where he is able to impact and interact with so many different kinds of people. “The volume of people I encounter every day can get overwhelming, but it’s also the reason I love my job. Considering how many interactions I might have with people throughout their educational careers and trying to figure out how I can make their journeys better or easier is a great feeling. It’s cool being able to take a step back and think about those things,” explained Lastreto. He went on to add how he likes being the connector between different aspects of the population at State. He ultimately serves as a link that helps students, professors and faculty members accomplish their academic goals. “Well, my 18-month-old daughter Leona keeps me busy these days. My weekends have transformed from watching sports and hanging out with my wife and friends, to watching cartoons and hanging out at the pool with Leona. You won’t hear me complaining, though. She’s an awesome little girl,” he added. He loves a good podcast. “I’m a big talk radio guy. There’s lots of good podcasts out there these days. The one I just finished is called ‘The Slow Burn’, and it covers big political scandals and events,” said Lastreto. He also tries to stay active, although Leona is pretty good about keeping him on his toes. “I like going on walks and hikes. I just prefer being outside rather than in a gym. Plus, it’s nice to listen to my podcasts on a morning walk,” he added. What is something about yourself people may not readily know? 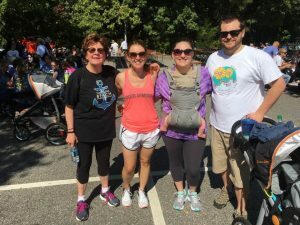 “Every year since 2015, I participate in the Gail Parkins Memorial Ovarian Cancer Walk. I do it in memory of my grandmother, so the cause is very near and dear to my heart,” he shared. This year, his participation in the 5K may be a bit different than years before. Vince and family at Gail Parkins Memorial Ovarian Cancer Walk in 2017. “This year, I think I’ll be pushing my daughter around in the stroller. I’ve done the 5K with my wife a couple times now, but I think I’ll really enjoy going around with Leona at such a special event,” said Lastreto. Another fun fact about Lastreto is that he balances being a father and working full-time while also being a student at State. “I take my classes completely online, so that’s helped me relate to students and faculty members while also using my personal experiences to help us improve at DELTA,” he said. Lastreto is set to graduate in May of 2019.